The leadership transition in the Bharatiya Janata Party in last five years was reflected in its manifesto, with this year's document only displaying Prime Minister Narendra Modi on its cover, unlike in 2014 when pictures of ten other leaders, including former PM Atal Bihari Vajpayee and his deputy L K Advani, featured. Vajpayee's picture is now displayed on the last page along with those of party's idealogue Syama Prasad Mookerjee and Deen Dayal Upadhyaya, who were on the second page of the 2014 manifesto. Besides Modi, pictures of contemporary leaders, including Home Minister Rajnath Singh, External Affairs Minister Sushma Swaraj and Finance Minister Arun Jaitley, who figured in the 2014 manifesto, are missing in the 2019 document. 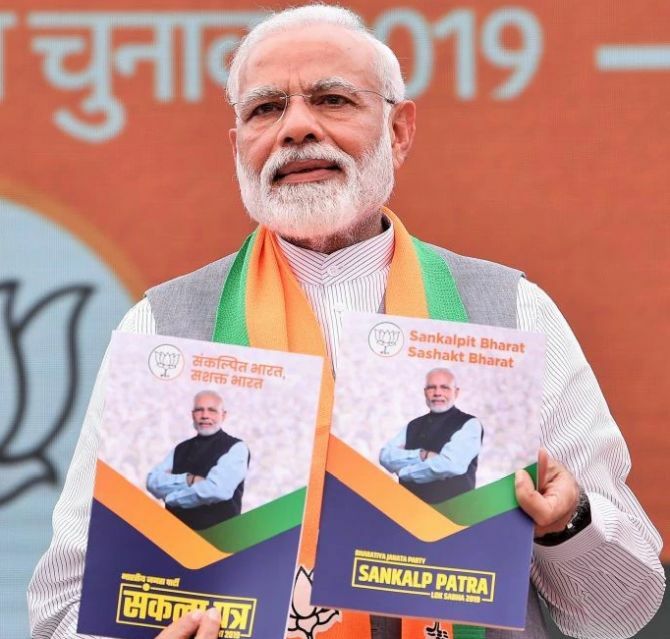 Pictures of veteran leaders Advani and Murli Manohar Joshi, who were not not given tickets this time, were also displayed prominently in BJP's 2014 manifesto. As far as language and tone of the manifesto is concerned, it is same in both the current and the previous manifesto, and so is its stand on contentious issues such as Ram Temple, Article 370 and Uniform Civil Code. 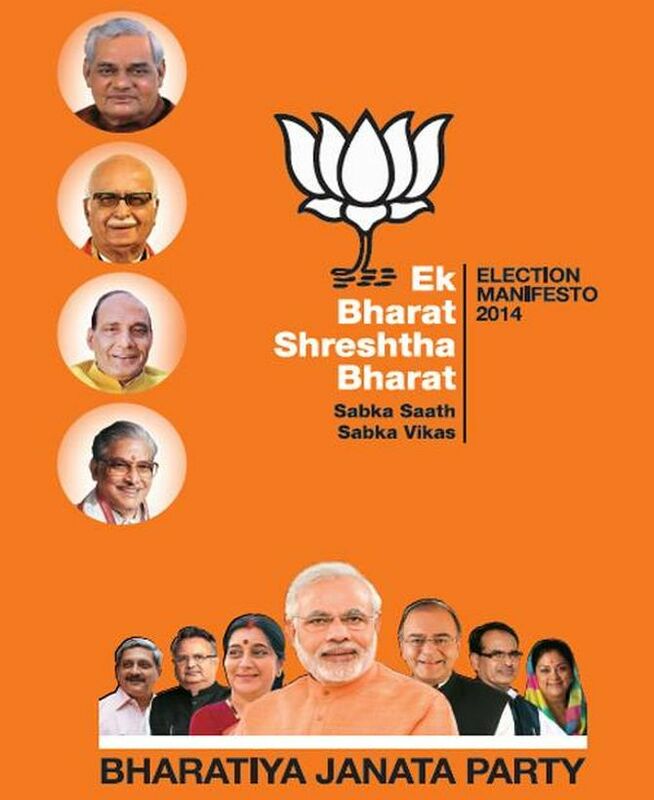 IMAGE: The cover of the BJP's 2014 manifesto. The cow is missing in the party's manifesto this year, though there is a mention of gaushalas (shelter for cows). In 2014, the party mentioned cow under the chapter of cultural heritage, along with Ram Temple and Uniform Civil Code. Unlike the 2014 manifesto where it promised a slew of measures for the minorities, there is only brief mention of them in its this year's document. Will Modi wave work its magic in west UP this time?